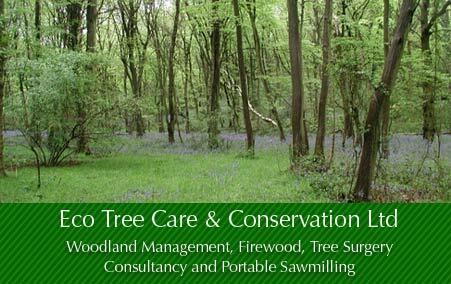 Eco Tree Care & Conservation Ltd is a professional, family-run, forest school, woodland and arboricultural consultancy business operating from Hertfordshire, on the border with Essex. The company has a long operating history since 2002 starting out undertaking woodland management services and domestic, and commercial, tree surgery work. Over time this has developed into the production of, woodland management plans, planting and grant scheme applications and arboricultural consutlancy. With nearly two decades of experience working with trees, and a scientific degree background the company is qualified and insured to carry out professional tree safety inspections, produce reports. We provide independant and impartial tree work recommendations and advice that can actually save money, and trees, by not recommending unnessesary tree works. We carry out all arboricultural consultancy work including Vegetation related subsidence surveys and reports, and BS5837 Surveys - Trees in relation to construction. See our tree surgery working range for a map of the towns and areas we cover in Hertfordshire Herts and some of Essex. Because of the location of our yard and homes our immediate core working locations for tree surgery and firewood delivery are Allen's Green, Ardeley, Babb's Green, Bacon End, Baldock, Barkway, Barwick, Bayford, Benington, Berden, Birchanger, Bishops Stortford, Bishop's Stortford, Bragbury End, Bakers End, Bramfield, Braughing, Brent Pelham, Broadley Common, Brookmans Park, Broxbourne, Buckland, Buntingford, Burnham Green, Bury Green, Chapmore End, Church Langley, Clavering, Colliers End, Cottered, Cromer, Cuffley, Dane End, Datchworth, Datchworth Green, Digswell, Eastwick, Essendon, Furneux Pelham, Goffs Oak, Great Amwell, Great Dunmow, Great Hallingbury, Great Hormead, Great Munden, Great Parndon, Green Tye, Hadham Cross, Hadham Ford, Hailey, Hare Street, Harlow, Hatfield, Hatfield Broad Oak, Hatfield Heath, Hatfield Hyde, Hay Street, Hertford, Hertford Heath, Hertingfordbury, High Cross, High Wych, Hunsdon, Knebworth, Little Hadham, Little Hallingbury, Little Hormead, Manuden, Matching, Matching Green, Matching Tye, Much Hadham, Nasty, Nazeing, Newgate Street, Panshanger, Perry Green, Puckeridge, Roydon, Royston, Sacombe, Sawbridgeworth, Stevenage, Spellbrook, Stanborough, Standon, Standon Green End, Stansted Abbotts, Stansted Mountfitchet, Stocking Pelham, St Margarets, Takeley, Tewin, Thorley, Throcking, Thundrige, Tonwell, Tree Surgeon, Ugley, Ugley Green, Wadesmill, Walkern, Ware, Wareside, Waterford, Watton at Stone, Welwyn Garden City, Westmill, Weston, Wormley and everywhere in between. Our Tree Surgeons know these areas and the trees very well. Abbess Roding, Albury, Allen's Green, Amwell, Anstey, Ardeley, Arkesden, Aspenden, Aston End, Audley End, Ayot Green, Ayot St Lawrence, Ayot St Peter, Babb's Green, Bacon End, Baldock, Bamber's Green, Barkway, Barley, Barwick, Bassus Green, Bayford, Beauchamp Roding, Benington, Berden, Birchanger, Bishop's Green, Bishops Stortford, Bishop's Stortford, Blackmore End, Bobbingworth, Bovinger, Bragbury End, Bakers End, Bramfield, Bran End, Braughing, Brent Pelham, Bridge Green, Broadley Common, Bromley, Brookmans Park, Broxbourne, Broxted, Buckland, Bull's Green, Bumble's Green, Buntingford, Burnham Green, Burton End, Bury Green, Chalk End, Chapmore End, Cherry Green, Cheshunt, Chipping, Chipping Ongar, Chrishall, Churchend, Church Langley, Clapgate, Clavering, Clay End, Clothall, Cole Green, Coleman Green, Colliers End, Colney Heath, Codicote, Coopersale Common, Cottered, Cromer, Cuffley, Cumberlow Green, Cuttlers Green, Dane End, Dassels, Datchworth, Datchworth Green, Debden, Debden Green, Digswell, Duddenhoe End, Duton Hill, Eastwick, East End, Elder Street, Elmdon, Epping, Epping Green, Essendon, Farnham, Farnham Green, Felsted, Ford End, Foster Street, Furneux Pelham, Fyfield, Goffs Oak, Good Easter, Gosmore, Graveley, Great Amwell, Great Canfield, Great Chishall, Great Dunmow, Great Easton, Great Hallingbury, Great Hormead, Great Munden, Great Parndon, Great Wymondley, Green End, Green Tye, Hadham Cross, Hadham Ford, Hailey, Hall's Green, Hammond Street, Hamperden Hill, Hare Street, Harlow, Harmer Green, Harpenden, Hartford End, Hastingwood, Hatfield, Hatfield Broad Oak, Hatfield Heath, Hatfield Hyde, Haultwick, Hay Street, Hebing End, Henham, Hertford, Hertford Heath, Hertingfordbury, Heydon, High Cross, High Easter, High Ongar, High Wych, Hill Green, Hitchin, Holder's Green, Holyfield, Hooks Cross, Hunsdon, Knebworth, Kneesworth, Kimpton, Langley, Latchford, Leaden Roding, Lemsford, Letty Green, Letchworth, Levens Green, Lindsell, Litlington, Littlebury, Littlebury Green, Little Berkhamsptead, Little Canfield, Little Dunmow, Little Easton, Little Hadham, Little Hallingbury, Little Hormead, Little Wymondley, Lower Green, Luffenhall, Magdalen Laver, Mallows Green, Mackyre End, Manuden, Margaret Roding, Marshbury, Matching, Matching Green, Matching Tye, Meesden, Melbourn, Mill End, Molehill Green, Monk Street, Moreton, Much Hadham, Nasty, Native Hedge Planting, Nazeing, Nether Street, Newgate Street, Newport, North Mymms, North Weald Bassett, Northhaw, Nuthampstead, Odsey, Ongar, Onslow Green, Panshanger, Patmore Heath, Perry Green, Pledgdon Green, Pleshey, Preston, Pond Street, Potter Street, Potters Bar, Puckeridge, Puttock's End, Pye Corner, Quendon, Rableyheath, Redhill, Reed, Reed End, Rickling, Rickling Green, Roe Green, Roundbush Green, Roydon, Royston, Rush Green, Rushden, Sacombe, Saffron Walden, Sandon, Sandridge, Sewards End, Starling's Green, Stickling Green, Sawbridgeworth, Shellow Bowells, Shephall, South Mymms, Stebbing, Stevenage, Sheering, Smith's Green, Spellbrook, Stagden Cross, Stanborough, Standon, Standon Green End, Stansted Abbotts, Stansted Mountfitchet, Stocking Pelham, Strethall, St Ippolyts, St Margarets, Takeley, Taverners Green, Tewin, Thaxted, Therfield, Thorley, Thornwood Common, Throcking, Thundrige, Tonwell, Toot Hill, Tree Surgeon, Turnford, Tye Green, Tyler's Green, Ugley, Ugley Green, Upper Green, Upshire, Upwick Green, Wadesmill, Walkern, Wallington, Waltham Abbey, Waltham Cross, Ware, Wareside, Waterford, Watton at Stone, Welham Green, Wellpond Green, Welwyn Garden City, Wendens Ambo, Westmill, Weston, West End, Wheathampstead, Whitwell, White Roding, Wicken Bonhunt, Widdington, Widford, Willian, Willingale, Wimbish, Woodend Green, Woodland Management, Woolmer Green, Wormley, Wright's Green, Wyddial and everywhere in between.